The plastic wheels on the truck can detach, exposing a metal axle and posing a puncture hazard to young children. This recall involves about 358,000 LEGO EXPLORE Super Trucks. The truck is a toy-in-toy product designed for children ages 18 months and up. 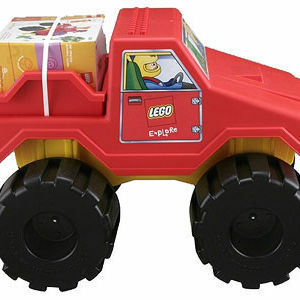 The toy features a red plastic pick-up/dump truck that measures about 15 inches high and 19 inches wide with four 7-inch black plastic wheels that are packed with a box of 40 LEGO DUPLO bricks in the cargo area. The unit has a row of DUPLO "studs" across the top of the cab. Molded yellow headlights and stickers on the front and sides of the unit create the idea of a windshield, windows, and doors depicting a LEGO figure in the driver's seat. The LEGO Explore logo is printed on the door stickers. The box of DUPLO bricks is not included in this recall. Various retailers nationwide, including Toys "R" Us and Wal-Mart, from August 2002 through August 2004 for about $20. Stop using the recalled toy trucks (not the bricks) immediately and contact LEGO Systems for information on receiving a refund. For more information, contact LEGO at (800) 718-1858 anytime, or visit www.lego.com.